Proposals for new developments at Scrubs Lane are coming forward thick and fast. Too fast, in that developers are trying to exploit an assumed level of public transport accessibility that is not there yet (and may never be). The two planning applications for North Kensington Gate have been ‘under consideration’ by the OPDC since mid September. 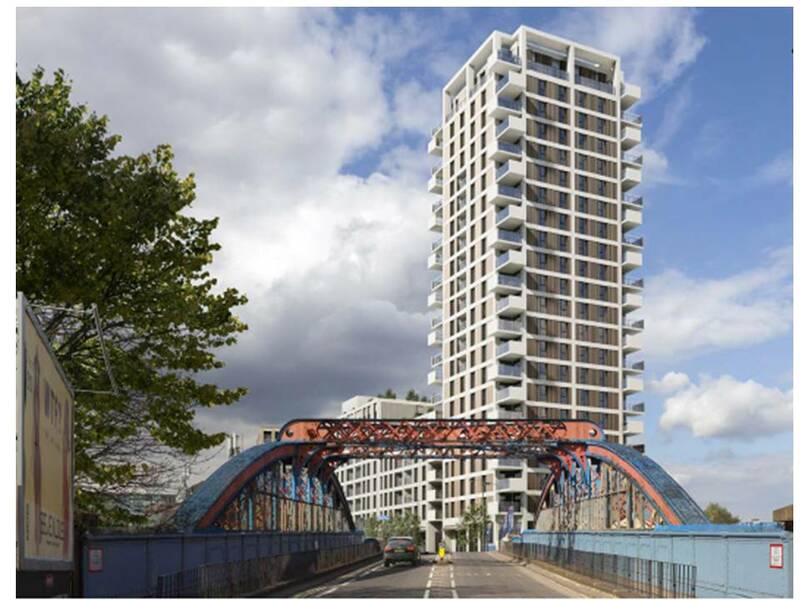 The Hammersmith Society, and St Helens Residents Association, submitted objections several weeks ago pointing out that these schemes involved super-densities of 450 housing units per hectare. Such a density is above the maximum in the London Plan Density Matrix for a development in a ‘Central’ area with the highest possible level of public transport accessibility (PTAL). Scrubs Lane as a location comes nowhere close to meeting this context, having no nearby station, a single bus route, and a PTAL level of 1b on a scale of 1-6. This has not stopped Aurora from taking their proposals to planning application stage. More disturbingly, the OPDC and TfL planners seem to have closed their eyes to this basic flaw with the Aurora scheme. The comments on the applications from Transport for London notes the current PTAL level of 1b, and fails to mention that ‘extensive planned transport improvements‘ will not be in place until 2026 (assuming they happen at all – the new Overground stations remain in doubt). We have been pressing the OPDC to release copies of the pre-application planning advice provided to Aurora. Copies of four such letters have now been added to the OPDC online planning pages for these applications. It is good to see that the OPDC seems now to to be following the example of London Boroughs such as Kensington and Chelsea, and publishing such advice routinely once a planning application has been submitted. The Grand Union Alliance has argued for such transparency. Many councils continue to treat such letters as ‘commercially confidential’ and refuse to release them. These letters cover many issues about the detailed design of the proposed buildings. But they start from the premise that mixed use development is acceptable with a density of 300 housing units per hectare. The developers initial plans were for 3 towers of 29, 22 and 18 storeys, with an averaged density of approximately 820 units per hectare. Not the the first time, it appears that such proposals were an opening bid by the developers, who retained plenty of room for negotiation while arguing that any reductions in density would compromise viability. Neighbouring landowners and waste operators Powerday and ERM have caught up with the Aurora proposals and have submitted letters of objection. Their concerns are that their own operations will be impacted on. They point out that the Aurora proposals are premature and present a picture of Scrubs Lane which bears little relation to its daily reality (queues of waste vehicles queuing to get and out of the EMR/Powerday access road, on one of London’s dirtiest and more congested streets). Given this background, we are becoming more optimistic that the Aurora proposals will not be approved in their current from. 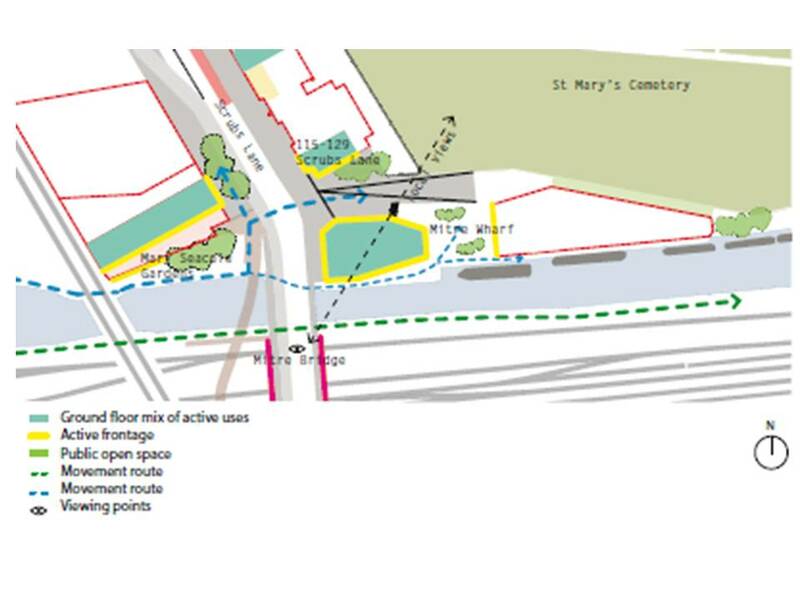 And we hope that the developers of ‘Mitre Yard’ are taking note of the points raised in the emr and powerday objections, which apply equally to the City & Docklands site at 2 Scrubs Lane. Scrubs Lane is a location in need of regeneration and redevelopment, no one would deny. But this needs to be ‘plan-led’ and not ‘developer led’. The first version of the OPDC Local Plan envisaged Scrubs Lane as a ‘high quality street’ on a sensitive edge of the OPDC area and adjacent to two conservation areas. The OPDC Planning Committee on 15th December will be considering a Direction of Travel document for Scrubs Lane, incorporating work carried out by East architects. The report forms part of a committee agenda too large to publish via this website (12MB) but which can be downloaded from this link to the OPDC website. This Direction of Travel document is the first stage in preparing a Supplementary Planning Document for Scrubs Lane, to accompany the final Local Plan. This draft document will be consulted on in early 2017. It contains a set of ‘principles’ for Scrubs Lane which reflect earlier consultations and most of which local people would probably support. e. visual permeability between buildings. Two options for the single taller building at at each cluster are explored in the document, 10 storeys and 18 storeys. Images providing a visual assessment of each option from a range of viewing points are included in an appendix, and are worth looking at. It needs to be remembered that buildings of 8 storeys remain a rarity at present in this part of London, let alone 10, 18 or more. 6-8 storeys as the norm is justified by the OPDC as providing an appropriate sense of enclosure to the street in response to the width of Scrubs Lane and Harrow Road and surrounding context. Cumberland House, currently the tallest building in Scrubs Lane, is in this range. Is this building height appropriate, on both sides of the street, with an extra very tall buildings at each ‘cluster’. Will this provide a high quality street, of a kind familiar to Londoners, at the edge of the OPDC area? developers arguing that their proposals are not financially viable unless they are allowed to build at extreme densities, above London Plan guidance. the task faced by OPDC planners in allocating across individual ‘Places’ a target of 24,00 new homes at Old Oak. This target was inserted into Annexe 1 of the current London Plan in its last review. As OONF and the Grand Union Alliance pointed out (in responses to the first draft OPDC Local Plan) the justification for this target rests on a Development Capacity Study which works backwards from this 24,000 figure, rather than explaining where it came from in the first place. Scrubs Lane, as an area in which developers have been assembling landholdings, is the first real test of how a proposed OPDC average housing density of 447 units per hectare will pan out at each Place, Cluster, and individual site. The current review of the London Plan provides the only opportunity to see this overall housing target revisited. Meanwhile we can only hope that the OPDC and its Planning Committee will continue to pursue a ‘plan-led’ approach and resist attempts by developers to max out their profits on every site in Scrubs Lane, in a period before sufficient transport infrastructure is in place. Proposals for 2 Scrubs Lane will be on display next week. There will be a further post on this site with more news.